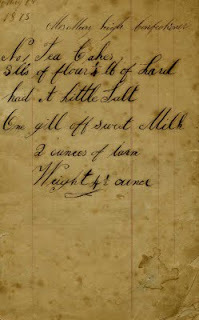 The Pennsylvania Historical Society has been collecting items since 1824, (conveniently located next to the Library Company of Philadelphia) and possesses the original Custis cookery book owned by Martha Washington, which was transcribed into Martha Washington Book of Cookery. Handwritten manuscripts, letters, store records, newspapers, city directories, pictures, genealogy and more sources of information are found at large and small historical societies. Many of the larger historical societies have started putting their catalogs online, so you can do some of your prep work ahead of time. The Historical Society of Delaware Library has evening hours. Although the days and hours of the smaller ones may be listed, call ahead to make sure a volunteer will be there and it will be open. Whether you travel across country or just two hours away, be sure to ask if they have published any of their works, to save you time in typing/writing. NY On the Score of Hospitality: Selected Receipts of a Van Rensselaer Family, Albany, New York, 1785-1835. edited by Jane Carpenter Kellar, Ellen Miller and Paul Stambach. Albany NY: Historic Cherry Hill, 1986.